South African Oscar Pistorius wants to make sporting history by becoming the first Paralympian to run in the Olympic Games against able-bodied athletes. Pistorius is a double amputee after being born with a congenital condition without any fibulas. "It's something I've aspired to," he told BBC Radio Shropshire, during a recent visit to the county. "In 2008 I missed out by just under a quarter of a second and this season I have gone quicker." Pistorius had attempted to make the Beijing Olympics in 2008, but the International Association of Athletics Federations deemed his blades provided an unfair advantage. In January 2008 the IAAF said he was ineligible to run in the Olympics, but this was overturned by the Court of Arbitration for Sport in May the same year. The 23-year-old failed to qualify for the South African team, but did win gold in the 100m, 200m and 400 metres (T44) sprints in the Paralympics. Pistorius now feels he is running quicker than two years ago to increase his chances of qualifying for London 2012. "I'm running 95% of my races on the able body circuit and at the moment I'm currently ranked second in South Africa," he said. "I'm close to the qualification standard for the Olympics." Away from athletics, Pistorius has teamed up with Shropshire businessman Mike Kendrick, who founded the Mineseeker Foundation, which provides support for amputees who have been injured by land mines in Africa. He has played an active role in providing five mobile support units which travel to patients, often in remote areas, to provide treatment and new prosthetic limbs. "It's changed the way I see things. It gives me the momentum to drive me on," Pistorius added. "I remember a lady who hadn't walked for more than 25 years. We made her a prosthetic leg and 12 hours later she was walking." 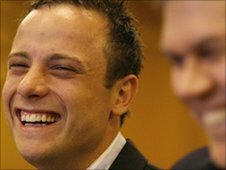 At just 11 months old, Pistorius had both his legs amputated and two months later he was fitted with his first pair of prosthetic legs. Now 23 years on, he is gearing up for the London Grand Prix this weekend in his preparations for the 2012 Olympics. "I'm aiming to run in the 400 metres in 2012 because my starts are shocking. "That's why I'm here to get experience this weekend in London. We're starting our preparations now." 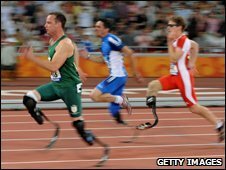 And if he did qualify for London 2012, Pistorius feels it could be a big moment in sporting history. "It would be a great moment in sport, I think it will be important just to show that people with disabilities are able to achieve things. "My life has been amazing in the sense that I've been able to do many things that many wouldn't think an amputee could do. "We've got mindsets about people some times that when they do normal things, people consider them to be extraordinary, it's one of the goals I'm going for," he added.